a) is the intercept a, the effect on response Y in the case where both fact1 and fact2 are 0? 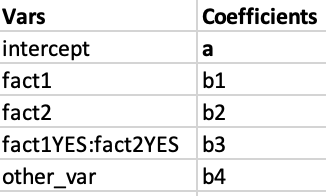 b) is the effect on the response Y when fact1=fact2=YES, given by b1+b2+b3? c) is the effect on the response Y when fact1=YES, fact2=NO, given just by b1? Not the answer you're looking for? Browse other questions tagged regression self-study interaction categorical-encoding or ask your own question. Does it make sense to interact 2 dummy variables?